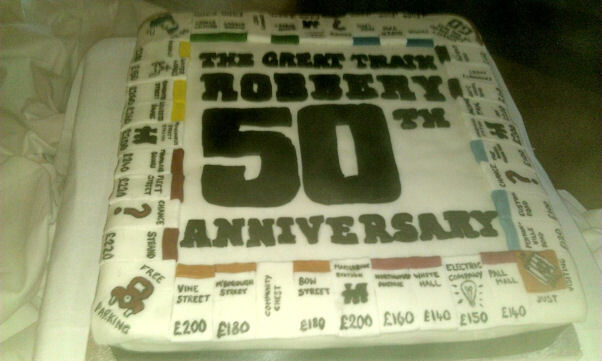 The Great Train Robbery of 1963 is one of the most famous crimes of the twentieth Century. On the 8th August fifteen petty criminals held up the London to Glasgow Mail Train on the West Coast Main Line at Sears Crossing between Leighton Buzzard in Bedfordshire and Cheddington in Buckinghamshire, stealing over £2.6 million pounds - around £46 million pounds in today's money. Exactly 50 years later, on the anniversary of the robbery, the Chief Constable of Thames Valley Police, Sara Thornton, held a commemorative meal to celebrate the work undertaken, by officers of the Bucks Constabulary, to bring to justice the gang responsible for this crime. The cake you see below on the left, in the shape of a Monopoly Board, was one of the central attractions, along with the real Monopoly Board again pictured below at the meal which was held at Eynsham Hall, Oxfordshire. The real board game (note the fingerprint powder still on the board) is on permanent display at the Thames Valley Police Training Centre Museum at Sulhamstead. 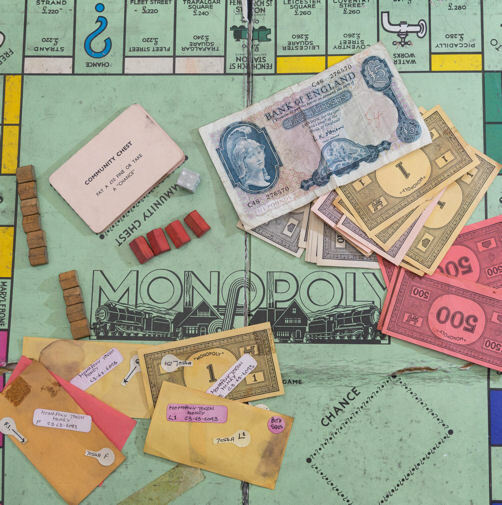 The gang are reputed to have used real money when playing the board game at their hideout at Leatherslade Farm. "Awarded in recognition of your meritorious police service in what is now generally referred to as the Great Train Robbery, an offence that occurred at Bridego Bridge, Buckinghamshire on Thursday 8th August, 1963 when in excess of 2.5 million Pounds was stolen from the Travelling Post Office Train between Glasgow and Euston. Your dedication to duty and service are greatly appreciated".